Mary Hoffman does not write this book with an insider’s perspective, but I still find the book to be a valuable addition to my multicultural library. 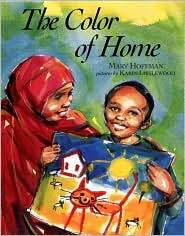 From Mary Hoffman’s website: The story for The Colour of Home was made up by me but based on the experiences of lots of asylum-seekers who became my friends. Character – Hassan is similar to many of the children in my school. He is a refugee from Somali, going through many of the same fears, worries, and adjustments that newcomers got through. Illustrations – The illustrations beautifully reflect the emotions Hassan feels throughout the story. Have children paint pictures of their homes and share out in the group. K-Gr 2-Hassan, a recent immigrant from Somalia, is homesick on his first day of school in America. Though the teacher is nice and the children are friendly, adjusting to a new culture, especially a different language, is a struggle. When the teacher distributes art supplies, Hassan discovers a way to communicate. He paints two pictures- one to share the story of his life in Somalia, and another that depicts his hope for a bright future in his new home. Readers gain a realistic child’s perspective on what it is like to be forced to emigrate from a war-torn country. The sensitively told story also demonstrates the value of art therapy in helping children to make the transition to a new environment. Littlewood’s impressionistic watercolor illustrations, many of them spreads, beautifully convey Hassan’s sadness, fear, and ultimate happiness. A title that will spark classroom discussion.-Ajokei T. I. Kokodoko, Oakland Public Library, CA Copyright 2002 Cahners Business Information.